From Green Onions to Purple Haze and beyond, the RT-20 is great for rotary effects. Authenticity of the sounds. Ease of use. No remote switching for the overdrive. No power supply included. The Leslie speaker sounds are impressively authentic. There's a time and a place for the sound of a Leslie rotary speaker, but when that time comes, you need just the right reproduction. For guitarists, the sound of a Leslie was often the backdrop to 1970s classic rock - Deep Purple, ELP, you name it - and the urgency and emotion stimulated by a throbbing, crunchy swell, especially as it slowly but irresistibly speeds up, is difficult to beat. The main feature of the RT-20 isn't the hypnotic visual rotor display but the four-way mode control in the top left corner. As with many Boss products, Roland's COSM technology is used to recreate - in this case - a trio of classic Leslie rotary speaker cabinet tones plus a sound based around the equally seminal Uni-Vibe. What's more, three of these settings also include a simulation of a Marshall 1959 amp top, which can be switched in and tailored to suit via the overdrive knob. What makes these tones even more authentic is that you can further alter the character of them via the balance control. Leslies had both a spinning horn and bass rotor that each produced their own specific parts of the overall tone, and you can balance between the two here. Impressive. 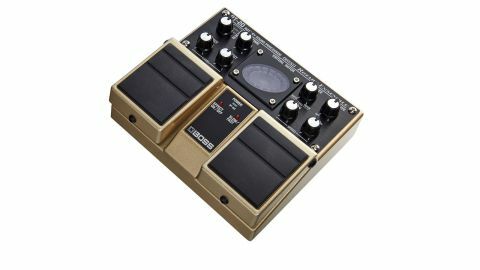 As well as a pedal that turns the effect on and off, the right-hand pedal allows you to manually switch between a slow and fast rotation, the speed of each regulated by the slow and fast pots. What makes the operation that much more organic is that you can also set the rate with which the change takes place via the rise control and, if you step on and off the pedal whilst playing, it's eerie just how Hammond-like your guitar can sound. Round the back is a headphones socket for private rotation plus the input for the optional EV-5 expression pedal, which allows you to manually change the speed at will: there's also a switch that permits you to voice the overdrive either for guitar or keyboard. Power comes courtesy of six AA-size alkaline batteries and, even though their length of continuous operation is estimated at 10 hours, we'd liked to have seen a PSA-240 supply included. The RT-20 is a professional unit and surely no gigging player is going to rely on batteries when using a unit such as this, so be prepared to pay out an additional £24 for the PSU. The overdrives do tend to get fiercer the higher the number mode you use, with mode one actually recreating the distortion of a Leslie's internal speaker rather than that of a Marshall head. If absolute authenticity is what you're after, begin here. Mode two offers a slightly more throbby tone with tremolo, while mode three swings the most wildly between extremes. For the iconic Hendrix warble, it's the Uni-Vibe-style mode four along with the surprisingly good overdrive. Hitting the old faithful E7#9 chord is extremely engaging: alter the intensity with the balance knob here and wail away. While the influence of the balance control on the other three modes is only subtle, we reckon that for the most part it's best to set it to the centre. We were genuinely unable to squeeze a poor sound out of the unit and the only niggle we would have is the lack of a remote switching option for the overdrive function: even an input for a Boss FS-5L footswitch would have been the cherry on the cake. However, we can safely say that this is the most authentic-sounding rotary speaker simulator we've ever come across, and if anyone has experience of actually carting a Leslie 122 around, you'll understand the potential of the RT-20.